In the course of digging through old records stashed in large filing cabinets, I recently discovered a forgotten bunch of black and white photos assembled by the Investigative Reporters & Editors Arizona Project of 1976-77 following the fatal car-bombing of Phoenix journalist Don Bolles. Some of them have relevance to my website commentary on “Don Bolles and Farm Labor,” hence this addendum. 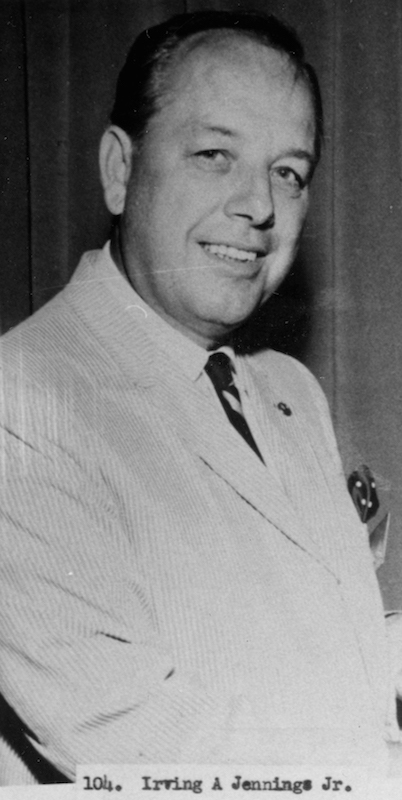 The general manager of the planned development in New Mexico called Colonias de Santa Fe on leased Tesuque Pueblo land was a Phoenix-based fellow named Irv Jennings, Jr. With Bolles’ help in the early 1970s, research colleague Steve Goldin and I eventually succeeded in proving that Jennings’ operation in New Mexico was mobbed-up, that through unreported sub-contracts he had “silent partners” in way of notorious Arizona organized crime figure Ned Warren and cronies. As a result, an embarrassed U.S. Department of Interior quickly stepped in to abrogate the lease and terminate the project. Ned Warren, a notorious Arizona land fraud kingpin and “silent partner” in Colonias de Santa Fe. Subsequently convicted in criminal court himself in Arizona, Warren was to die in prison of heart failure in 1980. While we were investigating Colonias de Santa Fe and Irv Jennings, Jr. Bolles, Goldin, and I shared substantial information back and forth between Phoenix and Santa Fe. Years later after Bolles’ death, when I reviewed what was left of his much purged files then kept as the “Bolles Collection” at ASU’s Hayden Library, whoever had removed most of what Bolles had amassed on prominent Arizona business and political figures often had overlooked the index cards. Sure enough, Bolles’ index card for Jennings remained in place with his annotation “See File.” But the file in question indeed was long gone. 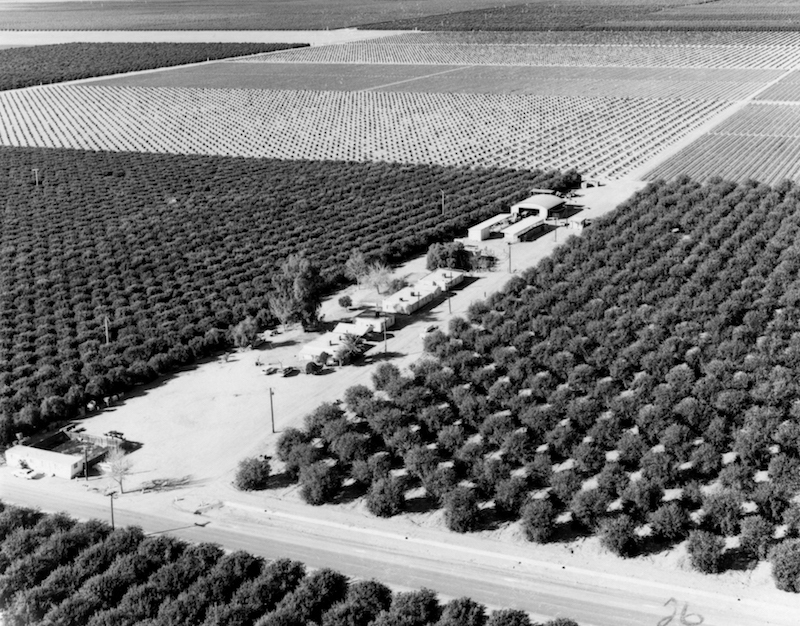 An aerial view of the thousands of acres of Arrowhead Ranch as it existed in 1976. Just a decade later it suddenly would be swallowed by the rapid suburban sprawl of metropolitan Phoenix, becoming an upscale residential development replete with a large shopping mall all still bearing the Arrowhead name. 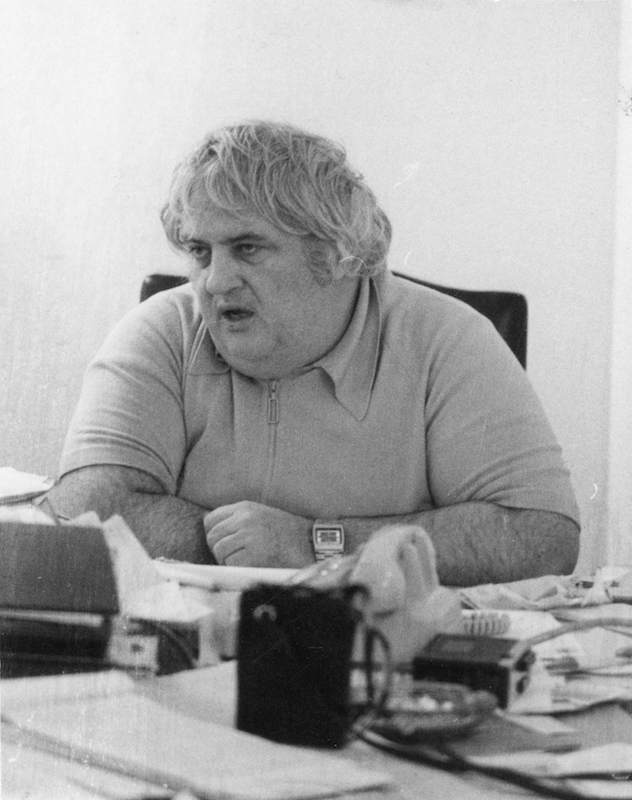 Legendary NEWSDAY editor Bob Greene in the fall of 1976 overseeing the IRE Arizona Project from his corner desk in an ad hoc newsroom on the top floor of the old Adams Hotel in Phoenix. Phoenix banker Bob Goldwater, brother of U.S. Senator Barry Goldwater and co-owner of Arrowhead Ranch in the 1970s. 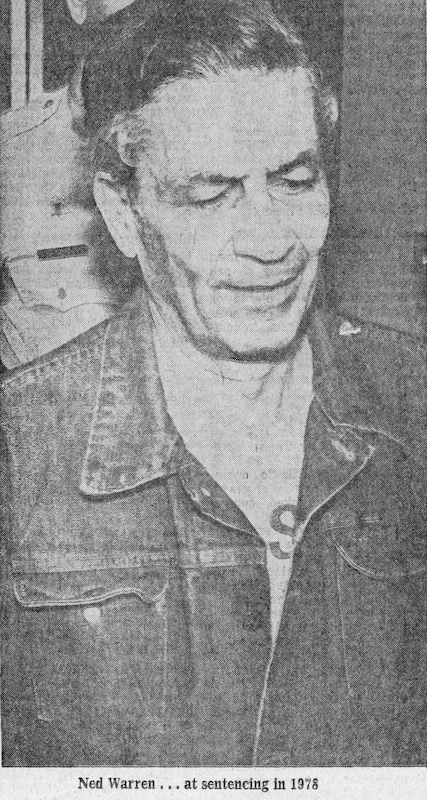 When Bob Greene, heading the IRE Arizona Project, took my suggestion to include an article on Arrowhead Ranch, the person recruited to serve as “tour guide” was former UFW organizer Lupe Sanchez, taking project reporters on clandestine evening visits into the sprawling citrus groves to find and interview workers. At that time, wealthy Phoenix banker Bob Goldwater, brother of U.S. Senator Barry Goldwater, represented his family’s financial interests in Arrowhead Ranch in joint ownership with the Martori family via a company called Goldmar. 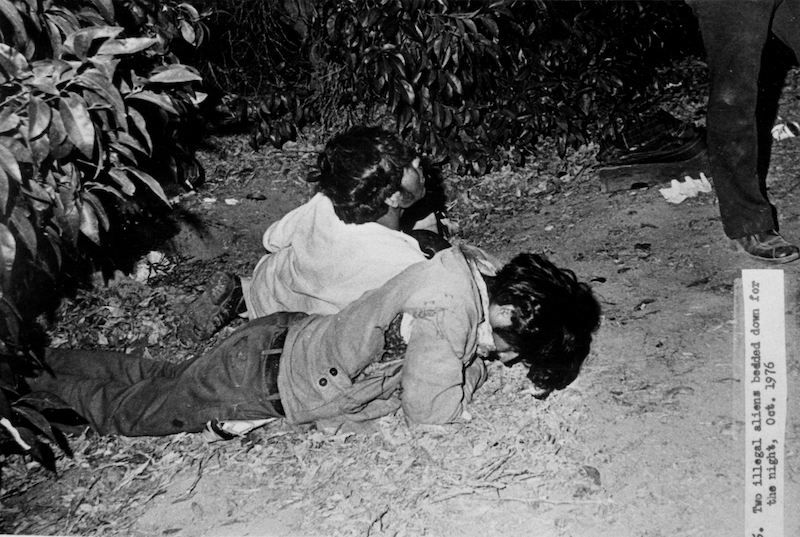 Considerable Goldwater family fortunes, in effect, were being derived in part from the abusive exploitation of undocumented Mexican National workers there. Especially back in the 1960s, 1970s, and 1980s, Phoenix was teeming with affluent businessmen and civic leaders who seemed to be lacking in any moral center whatsoever. But since it was Arizona, to borrow an already over-used phrase, at least it was a “dry” sociopathy. 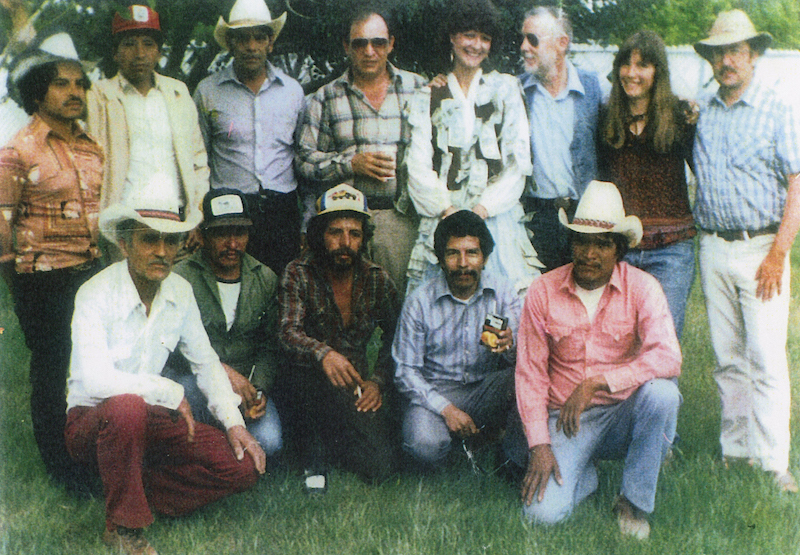 Lupe Sanchez, shown at the left, led IRE Arizona Project reporters in night visits to Arrowhead Ranch in the fall of 1976. 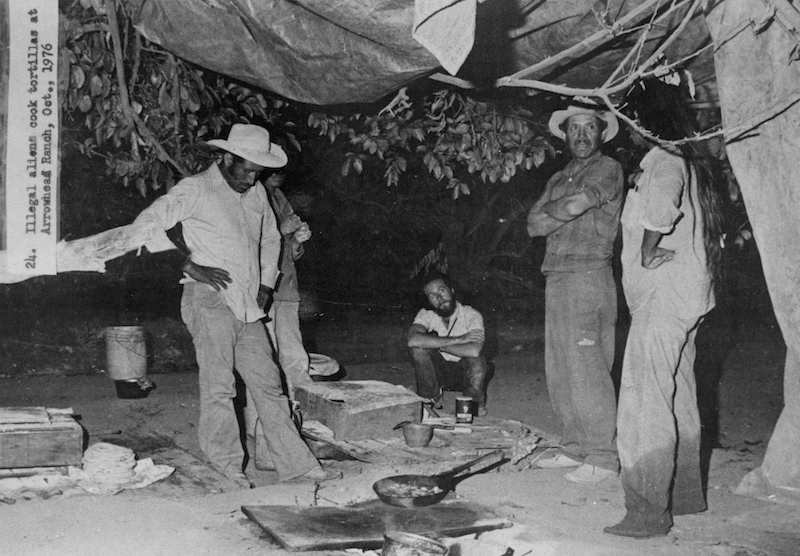 A year later in October 1977 Sanchez also directed the initial farmworkers strike at Arrowhead Ranch, then becoming head of the Arizona Farm Workers Union when the first labor contract was signed by Arrowhead Ranch in January 1979.
fall of 1976 preparing an evening meal at a make-shift open-air camp under the trees. Farmworkers at Arrowhead Ranch necessarily bedding down on the ground at night at Arrowhead Ranch in the fall of 1976, given the total absence of any housing option. A final color photo as a reflection of happier times has been retrieved from AFW archives, not from the IRE Arizona Project. It also was taken at Arrowhead Ranch in the early 1980s after a birthday party for a veteran and popular union organizer named Karen Kincaid, now living as Karen McGrew with husband and family in Raleigh, North Carolina. To Karen’s right, holding a cup, is AFW head Lupe Sanchez, now living in Mazatlan, Mexico. And to Karen’s left, also wearing sunglasses, is journalist and AFW press secretary Don Devereux, now of Tempe, Az. At the far right in that back row is another leading union organizer named Michael Carey, now residing in Imperial Beach, Calif. A third key union organizer is Jose Ojeda, kneeling below Karen, now living with wife and family in Surprise, Az. 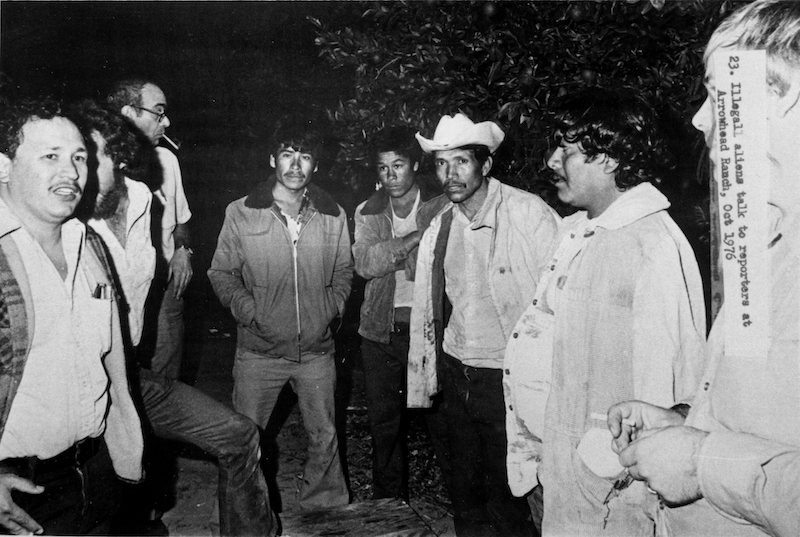 The other men are all Mexican National farmworkers, undocumented at the time, among hundreds of those very hard working folks enjoying vastly improved wages and working conditions as of 1979 under union contract at Arrowhead Ranch.